ome patios have a stunning view while others have a view that desperately need to be hidden. Whether your patio looks out over the mountains, captures a view of the sea, or does nothing more than peek into the neighbor�s lot, you can improve the view and the patio with the right d�cor. This space is a valuable part of your home, so you should make the most of it with the right decorations. When your view is seriously lacking, you need to do something to block it. Whether you are tired of looking at the neighbor�s yard or your patio backs up to a street, there are architectural changes you can make to alter the view. Create the illusion of a wooded backdrop by building a lattice wall and covering it with ivy. Imitate a Japanese garden with a beautiful wood privacy fence topped with a shallow pergola. Add a touch of color and whimsy by mounting fabric privacy screens to block the view. You will enjoy the new look and the extra privacy. Perhaps the issue lies within your own property. With a little creativity, you can turn a challenge into a glorious asset. If you have a steep slope in a heavily wooded backyard, then you might feel like a patio is out of the question. However, you can build a raised deck that will nestle among the treetops for a glorious view and incredible feel. If you have an outbuilding that is bland and boring, turn the wall nearest your home into the back wall of a rustic outdoor room. Add the frame of log walls and a log roof to the area in front of it, and you will instantly create a stunning outdoor room that will delight all who visit. The most incredible view in the world won�t be enjoyed if there is no temperature control on the patio. A stunning view can make up for a lot, but it won�t make you more comfortable if you are sweating in the blazing sun and miserable. Make any patio more sophisticated and luxurious with the addition of shaded areas. 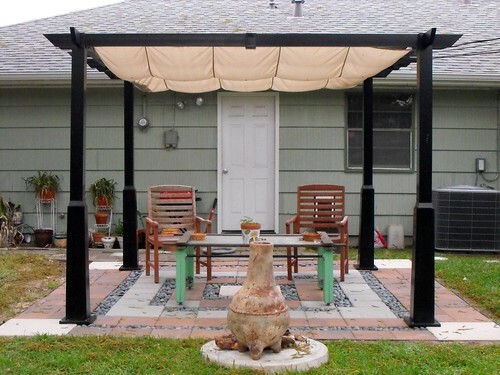 Use an arbor to hang curtains, or invest in a few patio umbrellas. Adding fabric will make your patio more sophisticated and the shade makes it comfortable, so you can actually enjoy that incredible view. Whether you have a stunning view or one that is less than desirable, you should decorate your patio to make it more enjoyable. Start with some sturdy, yet tasteful outdoor furniture. Wicker and rattan are traditional options that look great on any patio. Beautiful sculptures, sophisticated fountains, and lush plantings can be used to keep the focus away from unattractive views. If you have an incredible view you want to show off, then you should sprinkle the d�cor around the exterior of your patio area to draw attention to the scenery. Whether your patio has a boring or fantastic view, the right d�cor will help you achieve an excellent balance. A miserable view can ruin your patio experience, but you also don�t want to rely too heavily on a good view to make everything perfect. Take the time to decorate your patio, add beautiful d�cor and furniture, and create a stunning outdoor living area that you are sure to love. Jacquelyn Gilbreath is a freelance blogger who writes on behalf of www.outdoorfurniture.com, where you can find quality patio furniture.